The Cuban authorities cannot be held accountable in any way for these events. This is something I intend to explain, as well as the reasons and objectives behind every measure, why and what for they were adopted. The current president of the United States, with a minority of the total number of votes, acceded to power through a scandalous fraud for which the Miami mob applied in the United States the methods they had learned from their Batista-henchmen fathers and other corrupt politicians from the U.S. neocolony of Cuba, ousted from power by the Revolution. On November 4, 2000, tens of thousands of African Americans were prevented from voting, many thousands of voters made mistakes on their ballots because of a change in the order of the candidates’ names, and there was further fraud perpetrated during vote counting. This was how, by a margin of a few hundred votes, Bush obtained a majority in the state of Florida that determined his election. He is a considerate man who does not hide his obligation to the Miami mob and the compromises he reached with these people during a meeting in Texas. "I am very much aware of what you have recklessly told your close and indiscreet friends in the Cuban American mob: that you can solve the problem of Cuba very easily, in clear reference to the methods used in the sinister period when the Central Intelligence Agency was directly involved in assassination plots against our country’s leaders." Bush’s pledge was that he would solve the problem by literally removing me, something that, quite honestly, after 40 years of aggression and crimes against Cuba, could neither surprise me nor worry me much. His administration has been just as hostile and reactionary as everyone expected. The mob has achieved more power and influence than ever before within the administration. Genuine criminals of Cuban origins, responsible for the deaths of thousands of Central Americans, like the notorious Otto Reich, have been called on to hold senior posts in key positions for the application of Bush’s preconceived policies, ideas and pledges against Cuba. The fate and the destiny of over 11 million Cubans mean nothing to him. I will not elaborate further on what Mr. Bush thinks, or about his obsessions and fixed ideas. Our people and the world know more than enough about these things. Otto Reich would be the Assistant Secretary of State for Western Hemisphere Affairs. The Senate, both Republicans and Democrats, fervently opposed the choice. A recess of the Senate was used as the opportunity to have him appointed temporarily. Then, from this post, he was able to set the guidelines for State Department policy towards Cuba. Outrageous claims rained down. One day they would say that Cuba was planning electronic warfare against communications in the United States; and the next, that a Chinese ship loaded with weapons was headed for Cuba. Neither the ship nor the weapons ever existed. Amidst ludicrous claims like these, the most heinous accusation of all: that Cuba was developing a research program to produce biological weapons. All of the accusations were refuted and ridiculed. During this same period, in September 2002, Otto Reich named James Cason, a stalwart ally, as the chief of the USIS (United States Interests Section in Cuba). Once Otto Reich’s temporary mandate had expired, his ability to remain in the post would be subject to the risky challenge of Senate approval, and his chances there were very slim. Thus, he quietly disappeared from view. His place would then be taken by Roger Noriega, former legislative assistant to evil Helms. A short time later, in December 2002, Otto Reich was appointed Special Presidential Envoy for Latin America in the National Security Council, where the fundamental decisions of the President are drawn up and adopted. A terrorist bandit with his finger on the trigger of the superpower’s weapon aimed at Cuba! What better proof could there be of the Machiavellian plans of Otto Reich, his mob and his boss, than the actions of the chief of the Interests Section in Havana? What did Cason do before taking over the position formerly held by Mrs. Vicky Huddleston, who was not assigned to some European or Latin American country, as she had wished, but rather to Mali, in Africa? Cason’s appointment was no coincidence. Reich knew all about his work during Reich’s own tenure as Director of Public Diplomacy with the Reagan administration. Specifically, they had worked very closely when Cason worked in Central American Affairs in the State Department, which was the supporting base for the so-called ‘Contras’ in the dirty war against the Sandinista Revolution, in which Mr. Reich played a significant role, as demonstrated during the congressional hearings on the Iran-Contra scandal. Cason also had work experience in other Latin American countries like Honduras, where he was the second chief of the U.S. Mission, in El Salvador, Bolivia, Panama, Guatemala, Venezuela and others. Cason had declared in November 2001, at a conference on national security after the fateful terrorist attack on the Twin Towers, that our country was "the only one that had not joined in the regional chorus of sincere condolences, military support and diplomatic cooperation with the United States." The truth is that Cuba had strongly condemned those terrorist attacks before the national and international media, and expressed our people’s condolences to the people of the United States and our willingness to immediately offer medical and humanitarian assistance. Our country was perhaps one of the first to do so, if not the first. Cuba immediately offered to open its airspace and airports, to receive the passengers planes in the air at the time since landing in any airport in the United States had been temporarily banned. Cuba did not have to provide any military support to the U.S. war adventures. Upon learning of James Cason’s designation as the chief of the USIS in Cuba, the executive director of the Cuban American National Foundation declared: "We hope this gentleman is qualified to carry out a strong policy, as President Bush has ordered." James Cason appeared as the best choice to implement the predetermined policy of an increase and escalation in hostility towards Cuba from his State Department post. Before he had even arrived in Cuba, on August 6, 2002, five individuals hijacked a boat called the Plástico 16, based in La Coloma, Pinar del Río. The Cuban authorities, through Note 1428 of August 27, 2002, officially submitted a request for the hijackers to be returned to Cuba. Months later, the five hijackers were released in the United States. What follows is a chronological account of Mr. Cason’s activities in Cuba. Cason arrived in our country accompanied by his wife, and was received at the José Martí International Airport by Louis Nigro, deputy chief of the USIS. From the very outset, at a welcoming reception held at the USIS, he demonstrated the interventionist nature of his plans, when he stated, during a brief speech to the Cuban and American staff there, that "his goal in our country was to speed up the process towards a democratic Cuba, urging support for all those who were contributing to this transition." At a memorial ceremony for the victims of the terrorist attacks in the United States held at the USIS, Cason referred to President George W. Bush’s plans for the war against terrorism, and expressed "his hopes that the Cuban people would play a crucial role in the changes that should take place in Cuba, mentioning the freedom of expression as an element to take into account for future changes in our country." Four days after his arrival, a reception was held at Cason’s residence, with 17 counterrevolutionary group ringleaders in attendance. The reason for the reception was to introduce the new chief of the USIS to them and to determine their needs and interests. Cason said that he would work to implement the policy announced by President George W. Bush. He asked how he could help the "opposition" and to what extent the cooperation provided by the USIS had been effective so far. He declared that he was willing to offer both his residence and the Interests Section headquarters for the counterrevolutionaries to meet with diplomatic personnel from different countries. He said that he would travel around the country to learn about the situation of the various groups. He added that his plans included participating in political events, such as rallies, and posting the pictures and names of "political prisoners" in the consulate offices so that visitors would learn about them. A reception was held at the Cason residence for the same purposes as the previous day, but with different counterrevolutionary ringleaders. The topics addressed were subversive radio stations, "the press and independent libraries." The new USIS chief took advantage of the U.S. Food and Agribusiness Exhibition being held in Havana in those days to show another line of his hostile intentions. At the end of a function hosted by the American organizers for the exhibitors, at the Melia Cohiba Hotel, Cason read a statement to the foreign press indicating that while he appreciated the fair as a space for making sales, "There's going to be a lot of beef being shown, but I expect to hear and see a lot more bull than I do beef from the Cuban authorities." He added that Cuba is not a significant market for the United States, and that it has debts with the whole world. Businesspeople from other countries are waiting for Cuba to pay them, he said, and "we don’t want to be part of that queue." Then he claimed: "The Cubans want credits, and nobody wants to give them any, because they don’t pay. It’s a small market where the average citizen earns only 20 dollars a month. Cuba has a foreign debt of 11 billion dollars, he said, and if it has money some day, it won’t pay". His intentions were quite obvious. He did not, on the other hand, say a single word about the blockade, the economic war, the hostility and aggression aimed at Cuba by the United States government for 44 years. Cason and the head of the refugee program made a monitoring trip to the province of Villa Clara, where they visited individuals who had tried to emigrate illegally but were sent back to Cuba in compliance with the Migratory Agreements. On October 3 they visited a home in Caibarién, where they met with a group of these illegal emigrants, along with another ten people invited by counterrevolutionary Margarito Broche, head of a grouplet known as the "Independent Rafters Association, North Central Cuba, Peace, Democracy and Freedom". This is a group of illegal emigrants sent back to Cuba that has been transformed into a group of "dissidents", pampered and guided by Mr. Cason. On October 4, a similar meeting was held in the city of Santa Clara, with another group of illegal emigrants who had also been sent back in keeping with the Migratory Agreements. As a result, a number of these people repeat their attempts to illegally travel to the United States, knowing that as soon as they set foot on U.S. soil, they will be welcomed with special privileges. In the meantime, Mr. Cason recruits "dissidents" among them. Both the chief of the USIS and the government official accompanying him used aggressive language during these meetings, with frequent criticisms and a derogatory tone against the person of the President of the Council of State of Cuba. This is how the chief of the Interests Section monitors and indoctrinates individuals who cannot obtain visas to the United States because of their criminal and social records, and therefore must attempt to travel there illegally and are sent back to Cuba. The chief of the USIS hosted a breakfast at his residence, attended by counterrevolutionary ringleaders Martha Beatriz Roque Cabello, René Gómez Manzano and Félix Bonne Carcassés, as well as officials from the diplomatic mission. Cason reported that he had traveled to Villa Clara and seen "the poverty" that prevails in that province, in addition to making other comments about his stay there. Cason hosted a breakfast at this residence, attended by counterrevolutionary ringleaders Oswaldo Payá Sardiñas, Osvaldo Alfonso and Vladimiro Roca Antúnez, along with, on the U.S. side, the political and economic affairs secretaries at the USIS, Francisco Sainz and Ricardo Zúñiga. The subjects of conversation were the "Varela Project", the elections in Brazil, the situation in Venezuela, and counterrevolutionary grouplets in general. In the afternoon, and with the participation of six officials from the USIS, a working meeting was held at James Cason’s residence in connection with the "Assembly for the Promotion of Civil Society in Cuba" project, organized and promoted by ringleader Martha Beatriz Roque Cabello. Twenty-four counterrevolutionaries attended. Mr. Cason observed that he knew about the difficulties involved in meeting, which was why he was offering them his residence. He ratified his material and moral support, demonstrating his government’s position on "democratizing" the island. He then asked to be excused for not participating in the meeting, as he had other things to do at the Interests Section offices. He left them in his residence, protected by diplomatic immunity, and the corresponding food and beverage services. At 3:15 p.m., Cason and his second secretary, Zúñiga, arrived at the home of a counterrevolutionary ex-convict who exchanges letters with and receives prizes directly from President Bush, Oscar Elías Biscet González. Sentenced for actions he had carried out following instructions from the Cuban American terrorist foundation, he had been released five days earlier. The two men asked him countless questions on areas of interest to them for their counterrevolutionary political objectives. Mr. Cason told the counterrevolutionary about his plans to urge representatives of other diplomatic missions to make contact with them. A meeting was held in Cason’s residence with ringleaders Oswaldo Payá Sardiñas, Osvaldo Alfonso Valdés, Vladimiro Roca Antúnez, Oscar Elías Biscet González and a U.S. delegation visiting Cuba. This had become a customary demand made by Interests Section chiefs from every U.S. delegation visiting Cuba. Their goal was to boycott Cuba’s political and economic relations with other nations, through the use of any slander and lies that might occur to these mercenaries on the payroll of a warmonger and aggressive government threatening our heroic people. That same day, November 11, 2002, an AN-2 fumigation plane was hijacked and taken to the United States. The Ministry of Foreign Affairs, through Notes 1778 of 2002 and 180 of 2003, called on the U.S. government to return the hijackers and the plane. The U.S. authorities did not even press charges against the hijackers, who were released four days later. The plane was seized, auctioned off, and in fact stolen, in an open and obvious anti-Cuban maneuver. Cason attended a meeting at the home of counterrevolutionary ringleader Martha Beatriz Roque, with 13 more of his hired agents. Cason spoke to them about filmed material with personal attacks on the Cuban head of state. He also inquired about the sale of short-wave and medium-wave radios in hard currency stores in Cuba, and mentioned the possibility of bringing them into the country through the Interests Section’s diplomatic mail pouches, etc., etc. He then supplied those present with nothing less than four boxes full of copies of the Universal Declaration of Human Rights. This, as a gift from the government of a country that has subjected ours to a blockade for more than 40 years and threatened to destroy our country, as it has done in other parts of the world. He also announced his intention to arrange a meeting in January of 2003 between a delegation of U.S. doctors and the counterrevolutionaries present there. Those doctors could very well travel to Central America, or to countries in Latin America or Africa where thousands of heroic Cuban doctors provide care and save hundrreds of thousands of lives every year in remote areas where Mr. Cason’s American doctors are seldom seen. The counterrevolutionary ringleaders Orlando Fundora Álvarez, Yolanda Triana Estupiñan and José Barrero Vargas met at Cason’s residence. The meeting was arranged by the first of these. Their main objective: to gather information on people adversely affected by the Revolution –meaning hustlers, or individuals involved with drugs or other crimes and illegal activities– in order to claim compensation from the Cuban government. This was the first time that the grouplets used USIS premises for meetings not attended by U.S. diplomats. James Cason and a number of other officials visited the province of Ciego de Ávila on a "fact-finding" mission. Upon their arrival in the capital, they headed for the home of a counterrevolutionary, where they met with another four members of grouplets. Cason inquired about the situation of the counterrevolutionaries and the investigation carried out on them. In response, they regaled him with lies, as was to be expected, about purported beatings, physical abuse and harassment of their families. The "dissident" being visited, along with other individuals of his kind, had staged a public disturbance at the Ciego de Avila Provincial Hospital, interfering with the emergency room services for approximately two hours. The provocation orchestrated by these individuals adversely affected several patients. What was Mr. Cason doing there? A "social function" was held in the evening headed by James Cason with another 12 officials from the USIS, ten members of the diplomatic corps, including representatives from the United Kingdom, the Czech Republic, Poland, Greece and Chile, and 52 counterrevolutionaries from different groups. Unlike other activities organized by the USIS with these elements, this time there were no welcoming or farewell speeches. They dispensed with formalities and the guests arriving at the mission simply sat where they wished, ate and drank freely, and happily conversed about their common interests. There was, however, a 30-minute meeting between the 52 "dissidents" invited and some of the main ringleaders: Elizardo Sánchez Santacruz Pacheco, Vladimiro Roca Antúnez, René Gómez Manzano and Félix Bonne Carcassés. Photographs were taken to record the event for history. They all felt completely at home. It was such a pleasant experience to be at the diplomatic mission of the superpower conspiring against the Cuban people that are defending their small and blockaded island from the monster! Cason granted an interview to Channel 51 in Miami. Here is an excerpt from that interview. Although it has already been published, I think it would be worthwhile to include it here. Journalist.- …as chief of the United States Interests Section in Havana, you are now traveling around, you have met with average Cubans, with dissidents in Cuba. Have you also met with leaders of anti-Castro organizations in exile? James Cason.- Yes, two or three times. Whenever I go to Miami, I want to meet and I do meet with all of the groups, the Cuban-American National Foundation, the Cuban Freedom Council, independent groups, all of the groups here, because I want to explain what I have seen in Cuba, what is happening, and to hear their points of view on what we are doing, to see if there is something that we want to do that we are not doing now. Our conversations are very pleasant, and one of my messages is that the important thing in Cuba is that there is in fact an opposition. They are isolated, harassed, but they persist and have a lot of courage, and the important thing is that they meet, unite and concentrate on the essential things, on the rights they don’t have and the freedoms they should have. So they shouldn’t be focusing on personal concerns, on differences in ideology. The important thing is that the opposition has to gain a space, because the day will come when there will be a transition. There is a transition now, but there is going to be a new Cuba some day, and they have to play their part in shaping and deciding the future of Cuba. So they have to gain a space for themselves, and begin to discuss what needs to be done differently to change Cuba. It is important that they focus on what is important, not on what is non-essential. Journalist.- In the meetings you have had with dissidents –I don’t know if you want to go into these kinds of details– but where do you see that perhaps the dissidents are not on the right track? What message do you have for the dissidents? Before I ask you, if you will allow me, for a message to the anti-Castro groups in Miami. What message do you have for the dissidents in Cuba? What would you like to say to them, based on what you have seen? James Cason.- Well, first of all, that the future of Cuba… we Americans are not going to determine the future of Cuba, it is going to be the Cubans, outside Cuba and inside Cuba. They should, from my point of view, my advice is to focus on the essential. What are the important factors? To not be divided, to meet together and try to reach a consensus or an agreement on 10 points, for example, where they all agree, and not to talk about where they don’t agree. Because in a democracy, everyone has their differences, there are actions, but the important thing is that they are in a military dictatorship, and if the people don’t meet together, they won’t have much chance of prospering. So they should concentrate on the essential and look for points of agreement, not disagreement. Journalist.- One of your priorities is also to help dissidents in Cuba. How do you intend to help the anti-Castro opposition? James Cason.- Well, as I said before, by offering information, moral and spiritual support, letting them know that they are not alone, that the world knows what is happening in Cuba. One demonstration of this is the fact that many of the leaders have received human rights awards from Europe and other parts of the world. So the world knows what is happening in Cuba, and we are there to tell them about this fact and to help them in any way possible. We do not give them, it isn’t true that we are financing the opposition, as Castro says. The opposition is insisting on the fact that the system has failed, and we are there to offer them the support of the American people and the rest of the democratic world in what they are doing, which is demanding the basic human rights that Cuba signed in the Declaration of Human Rights, in the universal declarations, and has not fulfilled in all these years. After reading these public statements by Mr. Cason, how unfair it would be to say that the government of the United States and the chief of its Interests Section are interfering in any way whatsoever in the internal affairs of Cuba, or that the "noble patriots" gathered there were counterrevolutionaries on the payroll of the United States! James Cason had informed the Foreign Ministry that he would be traveling to Pinar del Río with four other USIS officials. He was informed in turn that this trip would not be authorized. It was known that Cason was planning to meet with several individuals. That same day, a USIS employee transported nine boxes containing radios and literature sent to counterrevolutionaries in that very province. Cason participated in a function held in the home of ringleader Héctor Palacios Ruiz for the launching of a markedly counterrevolutionary book, associated to the so-called "independent libraries" project. The book had been presented at book fairs in Guadalajara and Miami. Over the course of six days, James Cason and Ricardo Zúñiga went on a tour through the provinces of Las Tunas, Holguín, Granma, Santiago de Cuba and Guantánamo. They had filed their request to make private visits, however, what they actually did was to take material supplies to the counterrevolutionary grouplets, in order to strengthen and unify the so-called "opposition" and establish contacts with the religious sector. Particularly significant were Cason’s statements about the existence of something called the "6000 miles" plan, consisting of systematic tours throughout all of the country’s provinces, aimed at encouraging and supporting the counterrevolutionary grouplets with resources to ensure their development. As if we were back in the days of the U.S. intervention after our last war of independence against Spain, there was the proconsul of the empire organizing a political party. The Ferro cement boat Cabo Corrientes, from the Isle of Youth, was hijacked and taken to the United States. The Cuban authorities presented a diplomatic note requesting the return of the four hijackers. The United States has still not responded to the Cuban note requesting the return of the hijackers, who were immediately released. A Cuban border patrol boat was hijacked and taken to the United States. At this time, it is still not known whether the U.S. authorities have pressed charges against any of the four hijackers. The Ministry of Foreign Affairs presented a note to the USIS demanding the return of the hijackers and protesting over this new anti-Cuban action. The State Department has yet to respond to that note. In the evening, there was a function at Cason’s residence in honor of a visiting U.S. cultural delegation. Among those in attendance were 21 members of grouplets and five diplomats from the USIS. There, Cason consolidated a practice he had begun in late 2002: including counterrevolutionaries in official USIS social functions, to which he also invited Cuban professionals. Cason gave a press conference to a group of foreign journalists accredited in Cuba where he criticized our country and claimed that the Cuban authorities were afraid of letting books and other materials into the country. He noted that works by Martin Luther King Jr., John Steinbeck and Groucho Marx were among a shipment of books seized by Cuban authorities after being shipped in by the U.S. government. Of course, he failed to mention the openly counterrevolutionary and subversive works that came in the same shipment. "American diplomats were told it was a ‘firm decision by the government’ not to allow the books into the communist-run country for distribution to dissident groups, including independent libraries, U.S. Interests Section Chief James Cason said. "’They said it wasn’t the books, but who we were going to give them to,’ he told a small group of international reporters. He said the American mission has imported similar books in the past. "’It’s fear of losing political control,’ said Cason, who arrived in Havana five months ago.’"
James Cason and two other officials from the Interests Section participated in a press conference held in the home of ringleader Martha Beatriz Roque, organized to commemorate no less than the anniversaries of the beginning of the war of independence and the shooting down of the airplanes from the Miami terrorist mob organization known as Brothers to the Rescue. Foreign press correspondents interviewed Cason. In addition to answering questions, he read a document and made public declarations that were openly interventionist, offensive and defiant towards the Cuban authorities. He called on the other diplomatic missions based in Havana to follow the example of the USIS. That same day, the above-mentioned terrorist organization, Brothers to the Rescue, beamed an illegal television broadcast at our country from international airspace. Despite the fact that the Cuban authorities had warned the government of the United States before February 24 of the plans for this broadcast, and had clearly established that this would constitute a violation of the regulations of the International Telecommunications Union, the U.S. authorities did nothing whatsoever to prevent the broadcast. It was known that U.S. prison authorities, following instructions from the United States Department of Justice, had imposed a regime that violated the human rights of our five heroes, confining them to what inmates call ‘the hole’. In my speech at the closing session of the National Assembly of People’s Power latest meeting, I made statements responding to the offensive interview given by the Interests Section chief during his get-together with counterrevolutionaries on February 24. I should note that I did not make these statements earlier, because in the midst of the colossal effort we are carrying out to overcome obstacles and advance our revolutionary programs, I did not know in detail the extent of the insolence, temerity and audacity of Otto Reich’s envoy. "This past February 24, on none other than the day we commemorate the beginning of the last war of independence called upon by Martí, a gentleman named James Cason, head of the United States Interests Section in Cuba, met in an apartment in Havana with a group of counterrevolutionaries paid by the U.S. government. They were gathered, no less than to commemorate the Cry of Baire, a date of patriotic symbolism that is sacred to our people. Other diplomats received invitations, but only this illustrious character attended the event. "‘I am not afraid,’ he answered simply in response to a question from another reporter, as to whether his presence at the oppositionist activity could not be taken as an unfriendly gesture towards the Cuban government, which denounces dissidents as subversive groups. "Then, rudely and offensively, he added in perfect Spanish, ‘Sadly, the Cuban government is afraid, afraid of freedom of conscience, afraid of freedom of expression, afraid of human rights. This group is demonstrating that there are Cubans who are not afraid. They know that the transition to democracy is already underway. We want them to know that they are not alone, that the whole world supports them. We as a country support democracy, and people who fight for a better life and for justice." "The news story reporting his statements said, ‘Although foreign diplomats often meet with dissidents, it is not usual for them to appear at public events or express opinions on the government to the press.’"
Mr. Cason concluded his statements by saying, "I am here as a guest, and I am going to go around the whole country visiting all the people who do want freedom and justice." At that time, I added, "Anyone can see that this is a shameless and defiant provocation. It would appear that both he and those who ordered the offensive performance by this bully with diplomatic immunity were revealing that they are in fact afraid. Otherwise, his behavior was so odd that anyone could rightly be wondering how much alcohol was served at that ‘patriotic’ event. "Actually, Cuba is so much afraid that it will calmly take all the time needed to decide on its course of action regarding this bizarre official. Perhaps the numerous U.S. intelligence agents working at the Interests Section could explain to him that Cuba can easily do without this office, a breeding ground for counterrevolutionaries and a command post for the most offensive subversive actions against our country. (Applause) The Swiss officials who represented the US interests for many years did an excellent job, and did not engage in espionage or organize subversion. If this is really what they want to provoke with such insolent declarations, they could show some honesty and courage and say so. Someday, no matter when, the American people will send a true ambassador of their country, ‘fearless and untarnished,’ as they used to say about Spanish knights." The State Department confirmed that our five heroes had been transferred to Special Housing Units (also known as ‘holes’) and that as from that moment; the Bureau of Prisons would implement new procedures for consular visits. The Cuban Foreign Ministry delivered Diplomatic Note No. 365 to the chief of the USIS. The Note strongly responded his interventionist actions and public statements of February 24. The USIS was also informed that, in reciprocity with the measures adopted against our officials in Washington, and taking into account the subversive and illegal activity of the USIS, there would be changes in the regulations for travel outside of the area of free movement of this diplomatic mission, effective immediately, and the regime of notification of travel would become a request for permission to travel. From this moment on, in order to leave the City of Havana, USIS officials should request permission and wait for a response from the Foreign Ministry. The State Department confirmed to the Cuban Interests Section in Washington (CISW) the implementation of new measures for consular visits to our five heroes. A function was held at Cason’s residence with a group of 18 counterrevolutionaries. The Foreign Ministry delivered Diplomatic Note No. 390 to the USIS, protesting over the worsening of prison conditions for our five heroes. The note demanded an end to the regime to which they had been subjected, in violation of their rights; the restitution of all of their rights; and the possibility of direct and unconditional contact with all of their family members, lawyers and officials of the Cuban Interests Section in Washington. The State Department delivered a Diplomatic Note to the Cuban Interests Section in Washington in response to our note of March 10, applying the regime of permission to travel to our officials in Washington. Our Interests Section received through the State Department a request for travel to our country by anti-Cuban Congressmen Christopher Smith (Republican of New Jersey) and Frank Wolf (Republican of Virginia), who intended to meet with "civil opposition" groups in our country. This visit was openly provocative in nature and a part of the Bush administration’s escalation against our country. On March 18, the State Department informed that this visit had been canceled. Once again, a meeting with counterrevolutionary ringleaders was convened in the residence of the chief of the United States Interests Section in Havana. By now, it was practically a meeting every two days. The purpose was to hold a debate on ethics with alleged journalists. It was really the worst place in the world to discuss ethics. Numerous officials from the mission were present. Members of the foreign press were also admitted to this counterrevolutionary activity. "Nobody ignores the fact that Mr. Cason, the new chief of the Interests Section, came with instructions to carry out all sorts of provocations against Cuba, and that he has attempted to transform his diplomatic headquarters and his own residence into a venue for organizing, instructing and directing mercenaries who betray their homeland in the service of a foreign power, or violate other laws through acts that cause serious harm to the country, expecting total impunity. Several dozen of them are now standing trial in the courts that deal with crimes against national security. "How many things has the government of the United States done in the name of its national security, including even a brutal war, without the slightest consideration? But we have to allow the impunity of those who betray the country, paid by them, causing considerable damage in many areas. These are people who act against the interests of our country, against the security of our country, and this in a new and dangerous stage. "They are mistaken. They need to learn a little bit more about what kind of people we have here, about their education, culture, organization and preparation to fight on every front if this country is invaded. A One-Hundred Years’ War would begin in Cuba. We do not want this but we find ourselves in the need to prepare for it or fight it if it is imposed on us. "They are being tried in the courts that deal with crimes against national security, and this infuriates their masters." The chief of the United States Interests Section in Havana was summoned to the Foreign Ministry to receive two Notes of protest: 1) over the interventionist and counterrevolutionary conduct of Mr. James Cason, chief of the USIS, in violation of the 1961 Vienna Convention on Diplomatic Relations; and 2) over the illegal television broadcasts carried out by the terrorists of Brothers to the Rescue on February 24 and the passive attitude of the U.S. authorities that did nothing to prevent this act that violated the international standards ruling television broadcasts, despite prior warning from Cuba. Round Table programs on Cuban television unmasked the subversive and counterrevolutionary actions of the USIS and especially Mr. Cason. An Official Note on the blatant and repeated provocations of the chief of the USIS was produced and published in Granma on March 19. Thirty-two counterrevolutionaries were arrested for their mercenary activities in the service of a foreign power. The decision was made on the evening of March 14, as soon as it was discovered that a meeting of mercenaries had been organized in Cason’s residence, despite repeated warnings issued by Cuba, both publicly and through diplomatic channels, demanding an end to this unacceptable interference. This was three days before Mr. Bush decided to launch his ultimatum on Iraq on March 17. The State Department informed of the prohibition of various trips proposed by the Cuban Interests Sections Washington, including consular visits to Gerardo Hernández and Fernando González. Another 33 counterrevolutionaries were arrested for their mercenary activities in the service of the United States of America. 7:24 p.m. A DC-3 aircraft of the National Air Services Enterprise, covering the route from Nueva Gerona to Havana, was hijacked. Ten miles south of the Boyeros, Havana airport, when everything was ready for the plane to land, the pilot informed Boyeros Air Traffic Control (ATC) that there were political problems on board and that the plane would be heading north. He requested the coordinates for the shortest route because he had very little fuel left. He was guided to Key West. 7:30 p.m. Boyeros ATC informed Miami ATC that a DC-3 was being diverted from its course by armed individuals on board and was heading for Miami. A really unexpected and very strange development: the hijacking of a passengers plane in flight. Such an event had not occurred for years, since the Migratory Agreements were signed; it may have been induced by the Miami mob. There is no way to know. They have the hijackers and their accessories, to whom they gave residence, but they are not saying a word about it. 9:35 p.m. The United States begins the bombing of Baghdad and other cities in Iraq. This is really two hours and nine minutes after the hijacking of the aircraft. The chief of the USIS was summoned to receive a Diplomatic Note urging the return of all of the passengers and crew, the hijackers, and the plane. A similar note was delivered to the State Department in Washington. During March 20 and 21, the Cuban authorities maintained contact with the State Department and the USIS to continue demanding the immediate return of all of the passengers and crew from the hijacked aircraft, the hijackers, and the plane. Another six counterrevolutionaries were arrested, including four of the most active ringleaders, for their mercenary activities in the service of a foreign power. Two Informative Notes on the hijacking of the DC-3 were issued and published in Granma on March 21 to inform the public. The U.S. authorities informed the Cuban Foreign Ministry and the Cuban Interests Section in Washington that they would not return the six hijackers of the Cuban DC-3. They said that the six individuals had been formally charged with air piracy, and that the plane had been seized following the decision of a U.S. court, in response to a suit filed by a counterrevolutionary in Miami. During this time, anti-Cuban Congressman Lincoln Díaz-Balart circulated in the House of Representatives a report drafted by the USIS and leaked to the press by the State Department, recounting the supposed harassment to which officials at this mission are subjected by the Cuban authorities. Another counterrevolutionary was arrested for mercenary activities. An Informative Note was issued and published in Granma on March 22, under the headline "New Information on the Hijacked DC-3". "So now they do not want to talk about terrorism in connection with the hijacked DC-3? Of course, they do not want to use the word terrorism. They would rather say piracy, although it is a very offensive word as well, because if they said terrorism they would be admitting that terrorism is being practiced from the United States against Cuba, right now, at this very moment when a terrible war is underway against an Arab nation, in the volatile region of the Middle East, a war that has shaken the world. "They cannot say that they will try the hijackers for terrorism, because that would be acknowledging the truth. Why do these people leave? Because they are absolutely certain of their impunity. Why do these people leave, aside from the certainty of impunity? Because they are welcomed there as heroes, and used as raw material for anti-Cuban propaganda. "They leave because there is a law, in effect for 37 years now, called the Cuban Adjustment Act, a murderous law –as we define it– that has cost thousands of lives and created countless problems. "Very recently, individuals have arrived there on boats taken by force, on airplanes taken by force, and yet these people are freely walking the streets of Miami. The total certainty of the impunity and privileges and advantages offered by this law are a powerful incentive for terrorism. "Who is to blame for this? The government of the United States is the main culprit, even more so than the terrorists themselves, because of this law that is applied exclusively to Cubans. "Some people came to Cuba all the way from India and Pakistan, because they had heard of this Adjustment Act and they thought that they could benefit from it. They hijacked a recreational boat, almost fatally beating the tourism industry workers operating it, and willing to murder these people in order to get to the United States. As of now we have still heard nothing about what was done with them, if any of them has been sentenced, if they have been sent elsewhere. These are people who brutally battered the workers, leaving some of them unconscious, and the only reason they did not throw them all overboard was because they needed some to steer the boat to get them to Florida. The U.S. authorities are fully aware of this. "They are also aware of the threats, of the attempts to intimidate, the warlike theories against Cuba of the current U.S. administration, and these hijackers believe, just as some mercenaries do, that this can intimidate our people. They think that they are doing a favor for those who develop and implement such theories, like that of a pre-emptive attack. I will not discuss this subject in this special broadcast, because there would be many things to say, and I do not want to stray too far from the main subject that brought us here tonight. "But it should be made very clear that our country cannot be intimidated by anything or anyone, because this is a country that –while not renouncing the possibility of combat in any field– has learned to fight and is fighting, above all, with ideas, with a very high morale, far above the deluge of lies and slander used in an attempt to bury its exemplary revolutionary work. "This is a country that knows what it is doing, a country with a clean record, not only clean, but impeccable, exemplary. And it has succeeded in standing its ground and showing the world its political capacity, its conscience, its culture. This is no warning but no one should believe that this is a country of fools and idiots. "Getting back to the subject of the hijacked DC-3, where are the guilty parties? This question bears repeating. And why on earth have they not at least had the courtesy to send back the plane? In the official note I referred to, which I qualified as constructive, we expressed our wishes for the return of the plane, and seemingly it would be so, yet we have seen that that country is powerless to prevent that some people keep the plane there. "Dozens and dozens of American planes were hijacked and brought to Cuba, and not a single one was ever kept here. They stayed here just long enough for refueling and were sent back immediately. The hijacked passengers were treated with kindness and courtesy; they were not offered some junk food to eat at 1:00 in the morning. They were taken care of in every way, aside from the fact that everything possible was done –as in the case of that plane I mentioned– to prevent an accident. Nevertheless, it has now become customary for any airplane hijacked from Cuba to be seized: an incentive for potential hijackers and deranged people. "There is more. How can a government say that it cannot send back part of the crew of the hijacked plane, and refuse to accept any solution other than the humiliating and unjust solution of holding them there by force? In fact, they have been kidnapped; terrorist bandits, who risked the lives of women, children and other passengers, took them there. Oh, but they must stay there, because that was the decision of a judge, a judge in Florida no less. "How can they ignore the seriousness of a kidnapping perpetrated by holding large knives to the pilots’ throats? "How can they ignore that this was the way in which passenger planes were hijacked to be crashed into the Twin Towers in New York and the Pentagon, and that there was even an attempt to crash a plane into the White House? Could such a thing possibly be seen as a joke or as something insignificant in a country that saw thousands of US people die that day? And the methods used were identical: hijacking planes by holding knives to the pilots’ throats and then crashing them into a target. "If there is any country in the world where hijacking a plane by holding a knife to the pilot’s throat should cause indignation and horror, that country is the United States. And now, when an act like this is perpetrated in Cuba, against children, women, people of a certain age, retirees, honest people like these who have spoken here, these people were mistreated, locked up, and subjected to all of the things described here. "How can they possibly explain that while over 500 people die every year on the U.S.-Mexico border as a result of the attempts to stop these poor and desperate people from crossing into the United States, where their salaries will be 10 or 15 times higher, or some who have been living there illegally for years have to cross back and forth to see their families and die by the hundreds, even before the events of September 11. "They are announcing that there are now who knows how many new devices and who knows what kind of extraordinary equipment, the most sophisticated in the world, to prevent Mexican immigrants from crossing the border and to discourage all attempts to enter the United States there, where so many lives are lost; how is it possible then that they are now going to keep the airplane that was hijacked and use this as a pretext to grant privileges to a number of adults –at least, seven– who acted like accessories in this hijacking and not even investigate them? "They could send them back and we would give all guarantees. And we do something like that because we know how to honor our commitments. They could at least send these people back instead of setting a precedent that airplanes can be hijacked and the accessories can stay there, and everyone traveling on the plane, without exception, has been offered the possibility of staying in the United States. Where is their honor? Where is their integrity? Where is the morality of those who enforce such a policy? This is what we call an incentive for hijacking airplanes. "We know only too well the tricks and traps they have used before. And now the terrorist mob is stirring up a big scandal in support of the hijackers. The Office of Foreign Assets Control (OFAC) of the U.S. Treasury Department issued new regulations reinforcing the U.S. blockade against Cuba and adapting it to the subversive goals of the anti-Cuban policy developed by the Bush administration. Another counterrevolutionary was arrested for mercenary activities in the service of a foreign power. One more counterrevolutionary was arrested for the same reason. USAID announced that it would grant one million dollars to the University of Miami’s Cuba Transition Project. The State Department published a report on human rights in the world. The report contains a section devoted to Cuba, which emphasizes the false accusations against our country and expresses clear support for internal counterrevolution. The State Department’s anti-Cuban diatribe is similar to that of previous years. That same day marked the beginning of the foreseeable consequences that I had denounced in the special television program of March 22, the result of the way the hijackers of the DC-3 were treated and the privileges granted to the crime accessories, who were granted residence in the United States. "10:10 p.m. The President of the Civil Aviation informs that the Captain of an AN-24 aircraft, flying from the Isle of Youth to Havana with 46 passengers, has reported problems on board. He said that he did not have enough fuel to continue the flight and had thus landed in "Jose Marti" airport. He was in the midst of the runway. The hijacker, holding a grenade in his hand, threatened to blow up the plane if he was not supplied fuel to fly to the United States. "Be very patient. Take no decisions without analyzing carefully or consulting directly with us. This is a responsibility that lies with the government. So, as soon as possible we will contact you, because we also have some steps to take through diplomatic channels and we have to see how we can do it, since it is late at night. "A man with a grenade is a problem that demands serious thought. We must talk with him, if that’s possible. "Try to communicate with him to get more information: if there’s one person, if there are several. We must have that information, because we have been told there are six children on the plane. "We are thinking of ways to solve the problem that do not involve using force." I spoke with them extensively and in detail about what should be done. "Dagoberto, you must try to call Whitaker, the head of the Cuba Desk, immediately, and give him the following information: that a AN-24 plane with 46 people on board, including six children, was hijacked when it was on its way from the Isle of Youth to the Rancho Boyeros airport, by an individual who, according to the pilot, was carrying a hand grenade and demanding that he be taken to the United States. "That the pilot, since he didn’t have enough fuel, had no alternative but to land on the runway at Rancho Boyeros, where the hijacker is demanding fuel to be on his way. "That the hijacker is currently at the back of the plane holding what appear to be two hand grenades. "That there is no doubt that this is a consequence of the way the U.S. authorities behaved towards the plane hijacked on the 19th and also of the announcement extensively reported in the press that the hijackers would be released on bail. "The orders given to the Cuban authorities at the airport are, in the first place, to not use force, to talk to him and try to persuade him to give up. They will use the argument that the news about the previous hijackers being released on bail is not true. Tell him that they are in jail and charged with piracy, which is a serious crime. "That we first of all wanted to let him know what was happening, the line we will pursue, and we suggest that they think about whether there is any possible way of letting him know —that is, the hijacker— what the United States’ position is on this kind of action and what penalties they carry. In short: some kind of cooperation to solve this problem, and not only because of the danger involved in making the flight under these conditions, with one or two grenades in his hands, and we don’t even know if the safety catch is on. "Secondly, because we think that it would be harmful for the U.S. government if this second plane lands there 12 days after the first hijacking. "And thirdly, that there is no doubt that these precedents could trigger a wave of this kind of things, and it is in the interests of both the United States and Cuba that this not happen, because they jeopardize the safety of air passenger transport. Such actions tend to be imitated by irresponsible or deranged people. We beg them to also give careful thought to the possibility that an official from the U.S. Interests Section in Havana communicate directly with the hijacker. That would be something really constructive and useful. "11:57 p.m. (Cuban time) Dagoberto speaks to Whitaker and passes on the entire message. Whitaker asks for some details. He says that he will start to make phone calls and that he will call him back in a few minutes. "12:55 (Cuban time) [11:55 Washington time]. Whitaker, head of the Cuba Desk at the State Department, calls Dagoberto, head of the Cuban Interests Section in Washington, to tell him that he had spoken with his boss and with Cason in Havana, who were willing to cooperate and to pass on messages through the appropriate channels, adding that this is a very serious crime and if they reach the United States, they will be arrested and prosecuted with the full force of the law." We agreed to deal with the case jointly and by coordinating our efforts. Cason went to the airport. For the first time, he and Dausá, director of the Foreign Ministry’s North America Division, were allies for two hours in the futile attempt to talk the hijacker out of this situation. After 4:00 in the morning, everything was left up to the Cuban authorities, which kept the U.S. Interests Section in Cuba continuously informed of the way things were developing. We managed to have 22 hostages freed in exchange for loading enough fuel onto the plane for it to land in Alabama, and not in the extremist fiefdom of Florida. At first it seemed impossible because of the amount of fuel that a plane full of passengers could carry. Then it could be done when 22 of the hostages were allowed to get off. This was informed to the U.S. Interests Section. Supplying the AN-24 with fuel was not a problem if the U.S. authorities acted with the seriousness they promised and allowed the plane, the crew and the rest of the passengers to return to Cuba. Seemingly, the issue was discussed at very high levels. On Monday morning, we waited five hours for Cason’s reply, and he in turn was waiting for the government’s decision. The deal we had made with the man carrying the grenade after the 22 people got off was that the plane would be refueled and would take off at 11:00 a.m. The Head of the USIS asked for 40 more minutes. He was waiting for a response. Of course, it was already known there that the plane had enough fuel to land in another State. We managed to postpone take-off for 55 minutes, until almost noon. There was still no reply. When the reply came, the plane was already in the air. The absurd, stupid decision made was that the AN-24 should land in Key West. There, it was the same old story: brutal mistreatment and humiliation of the passengers, privileges for the hijacker’s accomplices, the kid glove treatment for the hijacker, the plane seized, the crew detained. It was disgusting! Otto Reich and the Florida mob got their way. I do not blame either Whittaker or Otto Reich’s subordinate for that. Cason behaved properly and sensibly, for 24 hours at least. The news that the hijacked plane had been refueled so it could continue its journey had the disastrous effect we had wanted to avoid: a wave of violent hijackings of passenger boats and planes. Hardly 24 hours had passed since the preceding incident when, at 1:40 in the morning, the Ministry of the Interior reported that its Command Center had just learned that the ferry Baraguá was leaving the harbor, that it had passengers aboard, no details on how many, and that all indications were that it had been hijacked. The Ministry of the Interior said that it was tracking the ferry with the Border Patrol boat 040 and that a speedboat was also joining in. The hijacked craft was sailing north at six knots per hour. At 3:00 a.m. the hijackers made radio contact and said that they had 50 people on board, including six or eight children and five or six foreigners, and demanded that they be given a boat so they could continue their journey to the United States, otherwise they would begin to toss hostages overboard. It was the first time that such a demand was made. After that it could have been a hijacked bus, that they put a knife on somebody’s throat and asked a bus driver to take them to Boyeros airport and demand a plane to go to the United States. It is perfectly clear that that is simply unthinkable. At 11:45 a.m., the ferry Baraguá, designed to sail in inside waters, ran out of fuel and was adrift 30 miles from the coast in a force 4 gale and in serious danger of capsizing and causing the death of the 40 people there actually were on board, 29 of them hostages, including women and children. At 2:32 p.m., the Border Patrol managed to attach a rope to the ferry’s bow, thus saving it from the danger of sinking, and towed it towards the port of Mariel. The hijackers, who did not oppose the rescue operation, continued to show a highly aggressive attitude, threatening to kill the hostages if they were not given fuel when they reached port. They held their knives to the throats of several women every time they demanded something. Only 40 hours into the hijacking, with the cooperation of the hostages themselves who jumped overboard, all were rescued unharmed. It was not necessary to board the vessel, which would have been done as a last resort. A few days later, on April 10, it was learned through the MININT Command Center in the Isle of Youth that between 5:30 and 6:00 in the evening, five individuals had unexpectedly and violently wrested an AK-M rifle from a draftee soldier who was on guard duty at a Revolutionary Armed Forces (FAR) reserve arms deposit. They had fled in a car. Eight people were involved in the plan. Their intention was to gather in the waiting room a few moments before the plane arrived, wait until six or 10 people had disembarked, --obviously, because they were eight, so they had to wait for a number of people to get off the plane, otherwise they wouldn’t have space-- then break the glass wall facing the runway using weights, force their way on to the plane and take the rest of the passengers hostage. They were estimated to be around 30. That same day NOTIMEX reported that a U.S. federal judge had upheld the decision of a Florida judge to grant bail to the six Cubans charged with hijacking and diverting a Cuban DC-3 with 31 people on board in March. In a period of barely two weeks, two planes full of passengers had been hijacked in midair, as had a vessel with capacity for 100 passengers, that was luckily carrying only 40 although they had said 50. Also, a soldier had been attacked and his automatic rifle wrestled from him so as to use the rifle and three knives to forcibly seize another plane that was about to land at an airport. The news reported by the press that a Florida judge had granted bail to the six DC-3 hijackers led to an immediate upsurge in the activities of potential emigrants who, because of their criminal record and antisocial behavior are prone to try to leave the country illegally, using these methods. From March 19 on, when the first DC-3 was hijacked, we have had proof of 29 plans and ideas to forcibly hijack aircrafts and vessels, something that had not happened in many years. Forty-eight hours after the AN-24 was hijacked and given fuel to continue its journey, two new plans were investigated on the same day. On April 3, two were investigated; on April 5, four; three on April 7; three more on April 9; and two on April 10. We had to radically cut off this wave of hijackings, which was shown to be in full development by the events that took place after the hijacking of the DC-3 on March 19, and the information offered about the first days of April. We could definitely not hesitate in applying the sentences handed down by the courts and upheld by the Council of State in the case of the hijackers of the Baraguá ferry. The measure would not be complete, though, if I do not clearly state here that no hijacked Cuban plane or boat will ever again be given fuel to continue on its journey to the United States or any other country, and the hijackers should know that they will be submitted to summary proceedings in the appropriate courts and that they should not expect clemency from the Council of State. Now they know what they should know. This is also a very hard measure, but it is unavoidable, as we need to definitely put and end to these actions. Experience shows that when the perpetrators know that they have no alternative, they abstain from committing such crimes. This was shown irrefutably in September of 1980, when two individuals, in this case unfortunately of Cuban origin, hijacked a U.S. passenger plane and commandeered it to Cuba in spite of the timely warnings issued in that respect. They were immediately sent back to the United States. No U.S. plane has ever again been hijacked to Cuba in 22 years because even those who are unbalanced or deranged know that they would be returned. That is how the government of that country should behave, and not continue to offer support and impunity in their country to the perpetrators of such actions, which are so dangerous and which are bedfellows of the murderous Cuban Adjustment Act that has cost our people so many lives. We know that those who try to go to the United States illegally are not the people who apply for and receive visas through the Migratory Agreement quota, who on the whole are peaceful people, who have no criminal record, and at least a ninth-grade education. Many are graduates of technical schools and there are also many teachers, professors, doctors and professionals that the USIS wants to recruit with or without the lottery. Those who travel illegally are people who would never get a visa because of their low-level of education or skills and their criminal record or bad social behavior. They give most careful consideration to the people they give visas to, based on a long list they once worked out, and which they wanted to update every year but we refused. They wanted to have more people from where to chose their recruits. They wanted to rob the country of the most talented, to deprive it of technicians that the economy needs. Then those who leave illegally are the ones who do not receive a visa and these are the most violent and dangerous. They have the potential to unleash a wave of attacks with knives or firearms, of taking hostages and threatening our people’s peace and safety. The worst part of the anti-Cuban conspiracy of the Miami mob group and the people they have positioned in Bush’s inner circles, the sworn enemies of the Migratory Agreements and the half-hearted opening of food sales to our country after four decades of a cruel blockade, the worst of it is the aim of breaking the Migratory Agreements and provoking a massive migration. Their main instrument is the absurd and murderous Cuban Adjustment Act, and the potential immigrants are former common criminals and the worst antisocial elements who still exist in our society and who will only disappear with the social and educational programs, unprecedented in the world, that are underway in Cuba today. Their evil idea is to bring about an armed conflict between Cuba and the United States. They place their hopes of destroying the Revolution in that, forgetting Maceo’s warning, which is more relevant today than ever: "Whosoever tries to take over Cuba will gather up the dust of its blood-soaked soil, if they don’t perish in the struggle." More than 40 years of repeated failure should persuade any U.S. administration that the most sophisticated weapons cannot crush our people’s steadfast resistance as they know beforehand what tactics to use and what forms of struggles to employ to reduce to zero the attacker’s technological superiority. A country cannot be conquered with armored divisions, thousands of tanks, helicopters, fighter planes and bombers, dozens of aircraft carriers and cruise missiles, tens of thousands of missiles. Once the cities and the whole country are occupied, --and this must be considered a basic principle-- millions of people in the cities and countryside have to be governed. If they think that the Miami mercenary groups will be of any use in Cuba, they will last about as long as a snowball in hell. 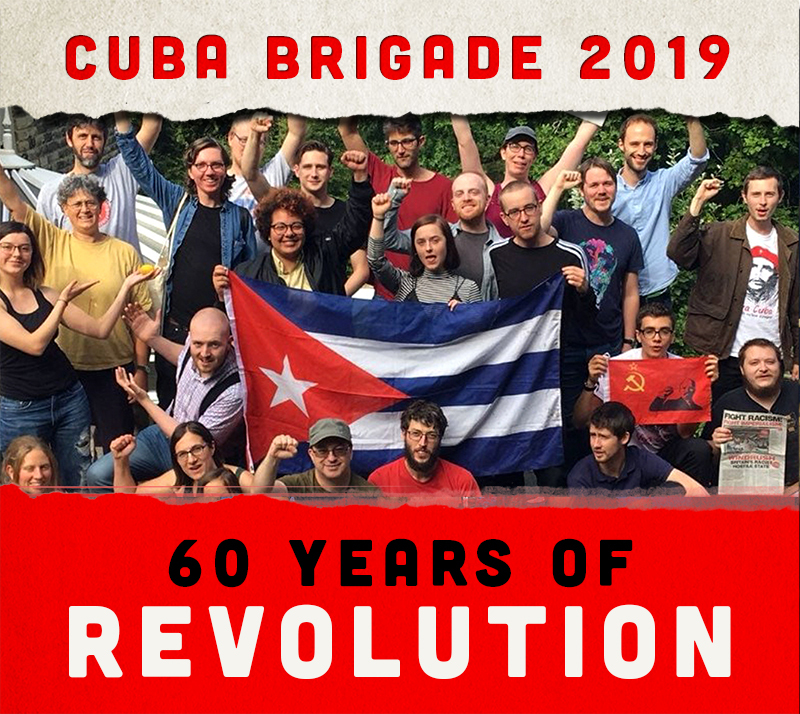 Once our top leaders are dead, none of who would ever wave the white flag, tens of thousands of fighters will take the place of the leaders who die, and the people of Cuba will fight on, generation after generation, against the forces of occupation. That is, the war would not end with the occupation of the country, it would rather begin then. Never in any era, no army anywhere in the world has fought against the men and women of a people made up of hundreds of thousands of revolutionary professionals and millions of people with a high and thorough education, culture and consciousness, who know that there is no parallel in history for their work of justice and humanity created in decades of struggle under blockade, hostility and aggression by the most powerful country that could possibly exist. The U.S. government, for example, has embarked on an adventure in the Middle East to conquer a country of 24 million people, surrounded by hundreds of millions of people who share the same race, the same religious beliefs and the same culture, one of whose distinguishing characteristics is indifference to physical death, all of which makes them an awesome community whose potential for resistance and struggle should be enough to keep the superpower’s current political strategists awake, since they stand at the threshold of what could be for them a tragedy many times worse than that of Vietnam. The Shiites in Iraq are already demanding that the invaders pull out, that their oil is returned to them and an Islamic state be proclaimed. We must not forget that a movement of the Iranian Shiite Muslims, wave after wave of unarmed masses, who didn’t care how many lives were lost, got rid of the Shah of Iran, who was the United States’ most powerful and most heavily armed gendarme in that part of the world. The Sunni Muslims will not remain far behind. They have never had more reasons to unite. Continuing with the report on what has been happening in our country, I should note that there were 11 people in the group that attacked the Baraguá passenger ferry. They took 29 passengers hostage, including four young female tourists, two French and two Scandinavians whom they threatened to kill first, aware of how much harm such an action would bring on the country’s economy. Actually, their actions were not politically motivated but they did know where they could cause the most damage, therefore, they threatened to kill the tourists first in order to achieve their goal. They had a handgun, with the safe removed, pressed on the head of one of them. The vile propaganda of imperialism and its allies has insisted that those who were executed were so-called "dissidents", that is, those who were arrested, tried and sentenced for treason to their country, for acting as mercenaries in the service of a foreign power which for more than 40 years has blockaded their country and threatened to destroy the Revolution, to do to Cuba what they have just done to Iraq. Not one of them was even sentenced to life imprisonment, which is what the Miami courts did to the five Cuban heroes imprisoned by the empire for fighting against the terrorist acts with which the United States has inundated our country. All of those who took part in the three hijackings I have described and in the attempt to hijack a third passenger plane, almost without exception, have a record of common crimes. Of the three sentenced to death, --and I will avoid mentioning their names out of respect for their families-- the main leader of those who hijacked the passenger ferry had been involved in 15 criminal proceedings for or investigations into common crimes; he was sent to prison several times; he was given an official warning about harassing tourists 28 times and on 119 occasions he was taken to the police station for a variety of reasons. The second one stood trial five times for common crimes and was found guilty and sentenced on four of those occasions. The third one was involved in seven criminal proceedings, including one for an attack with a sharp instrument on a construction worker –a foreman in a construction brigade-- who died from the wounds. Only one of the other five, who were given long sentences, did not have a criminal record. Spokespersons for the U.S. government express their concern about a massive exodus of illegal emigrants. Such concern could not be more hypocritical when, deliberately and coldly and for vile purposes, the Miami terrorist mob and its most important allies in high power circles, such as Otto Reich and Roger Noriega, encourage large-scale hijacking of Cuban planes and boats by ex-convicts and common criminals, who take passengers and other innocent people hostage in order to go to the United States. What they are really after is an inevitable massive exodus —as it happened on August 4, 1994— which will serve as a pretext for a military aggression against Cuba. The Revolutionary leaders in Cuba are fully aware of the political cost of the measures they felt obliged to take. Nobody should think that this was not thoroughly analyzed, from every angle. We suffered beforehand as we realized that many of our friends would hurt as well as a large number of people in the world whose religious, humanist or philosophical sensitivity over the death penalty we are very familiar with and in many ways we ourselves share. A few weeks ago a famous writer wanted to interview me and one of the many subjects he brought up was that of the death penalty. I will take the liberty of using some excerpts from that interview, although I will not reveal the name. The Writer.- Comandante, in many countries in the world the death penalty is being abolished. All the countries in the European Union have abolished it and many people wonder why in Cuba, where so much progress has been made in the social field, the death penalty has not yet been abolished. Fidel Castro.- I think that is an interesting question. Did we have doubts about the death penalty when we became revolutionaries, when we were fighting or when the Revolution triumphed? Did we have doubts about it in all those years of invasions, dirty war, assassination attempts and all the rest of it? No, we certainly did not question de death penalty then. What we thought a lot about was the different ways, the procedures and the legal aspects of the subject. What has happened? Political movements have had to defend themselves, both revolutions and counterrevolutions have defended themselves through procedures of one sort or another. For us the most important thing was to defend ourselves with rules, legal procedures, to avoid injustices and above all to avoid anything that was not legal and that was not judicial which we avoid and have avoided at all costs. Not that we were happy to apply the death penalty. We looked at it as a matter of life or death. On the whole, those who are involved in these struggles start out from the principle that it is a life or death struggle. If revolutionaries do not defend themselves, their cause is defeated, and they pay with their lives. In this case we could say the lives of millions of people in this country would die, either fighting or murdered later on. For us that was very clear. And in the process of our Revolution we saw that and we learned that. Many of those who are involved in terrorist activities don’t think they will defeat the Revolution. All of them live with the conviction that the United States and its military might will defeat the Revolution. Counterrevolutionaries are convinced that their cause will triumph for one reason or another, and in this very special case because our struggle was against the United States. For them it was a matter of gaining a few Brownie points; being in jail did not worry them much nor did it dishearten them. They were waiting for a U.S. intervention to overthrow the Revolution. How can we stop them? There is a lot of mercenary behavior among counterrevolutionaries; they defend interests, not ideas. Fortunately, we did not have to fight against fanatics of ideas or causes. We had the privilege of fighting against people who were mostly motivated by material, economic and social ambitions. Remember that gentleman who sworn as President of Venezuela after the coup d’etat on April 11, and he was almost captured by Chavez’s own bodyguards who were still there, in their barracks, but these people thought they were toy soldiers, not human beings. We would not have been able to free ourselves from fanatics; I would not have escaped with my life from the hundreds of assassination plots that were hatched against me. Once, when I visited Chile in 1971, they had me in front of a camera like that one, which was filming us, closer than that, and it had a machine gun inside, during a press conference. They were definitely going to die if they fired that gun. But when their lives are in danger they don’t shoot. Those who thought that by committing terrorist acts and killing people, murdering teachers, sacrificing the lives of peasants and the lives of soldiers who are our strength, they had the hope of gaining some reward afterwards, those people feared death. This is why the most serious crimes were punished by the death penalty. That was the prevailing way of thinking. That battle was waged and won, and in fact, the death penalty has not been used for counterrevolutionary crimes for many years now. The last assassination plot was to be executed at that meeting in Panama; it was organized and directed by Posada Carriles, the man behind the blasting of the Cuban plane off the coast of Barbados. The Writer.- At the Ibero-American Summit meeting? Fidel Castro.- Yes, and he was caught. We uncovered him by infiltration methods, seeking out information and even by technological methods. We also have the ability to know where a person is when speaking on a cell phone, for example. Now there is a struggle because they want to release him. All of that was financed from the United States. Another kind of crime came into being: they sent young people from Central America and paid them five thousand dollars to plant bombs: Guatemalans, Salvadorans and others. They didn’t come themselves, I mean, the big shots, the main ringleaders, they used mercenaries for that. None of those who were given the death penalty has been executed. The Writer. - They were given the death penalty? Fidel Castro. - They were sentenced to death but they have not been executed. This does not imply that we have relinquished the use of this penalty, I mean, the use of that law. The law still exists, the law that established it. For you never know what barbarous thing they might use against Cuba. If they blow up a plane full of passengers, our people would not accept either a reprieve or a pardon for those responsible. On the whole the people’s position on this matter tends to be hard line, although a government does not always have to do what the people ask. De facto, the death penalty has not been used in the last few years, but we have not relinquished it, that is, the death penalty for crimes of one type or the other. I don’t think the world we live in allows for that. If terrorism is used against a country, if they commit crimes and kill children in a school, I can guarantee that it would be very difficult in those circumstances not to use the strictest laws, because I don’t know what it is, if not terrorism, and what one could call putting bombs in a school in the interests of a foreign power or government. The Europeans are not under a blockade, nor are bombs being set off every day. I don’t know what they did when they had those groups like the Red Brigades. I have also heard of people being executed abroad, such as the Basques for example. The Writer.- Are you referring to the GAL, for example? Because there is no death penalty in Spain. Fidel Castro. – There is no death penalty, but now something has happened that we have never done, in Europe dozens of people have been executed without trials. The Writer.- Without legal proceedings. Fidel Castro.- Let them write the history of the members of the Red Brigade executed without trials or let them write the real history of the ETA members executed without trials when there is no death penalty. We have the death penalty here, but there are no executions without adequate legal proceedings, there is not a single case. So you can see the truth about appearances and the real differences, where the truth might lie and where there might be some demagogic and hypocritical theories. There is some of everything. We guarantee that there will never be an execution here that is preceded by the corresponding legal proceedings and that there will never be torture. You can ask those who planted the bombs if they said anything because they were tortured or if they were beaten. Of course, they are not fanatics, they are mercenaries, they talk straightaway, and all you have to do is show irrefutable proof. They explained how they brought in the explosive in a small television set, the plastic explosive of such and such a color and manufactured so the dogs would not be able to detect it, a special type of explosive; where the fuses were hidden in some cables; the digital watch that they brought with them to add to the device and make it explode five minutes later, if they wanted, or after 99 hours. Very sophisticated. That mercenary wanted to set an Olympic record with five bombs exploding almost simultaneously. In Miami, meanwhile, the Foundation said that it was people from Military intelligence and State Security who were discontent, a slander that for them was proper and legitimate. There are a pile of publications about this. The Salvadoran cooperated a lot, quite calmly, in helping to discover the methods and techniques that Posada Carriles used to carry out terrorist acts against the hotels, which caused the distressing death of a young man, that helped us to unmask the people really behind them and to put an end to such act until now. I should say that thee was really an extraordinary cooperation. There are comrades here who could better explain how cooperative he was from the very beginning. He even received phone calls, he placed calls himself, and he did everything he was asked to do, and he did so without pressure. His family came for the trial, they visited him in jail. A number of circumstances concurred so that even those who worked with that young man in the investigations for many months, deeply disliked the idea of applying the death penalty for the crime committed. This is the whole truth, and I think they are right. There are still some who ask, but Why? But I tell you that that man paid an important service and helped to seize others because he had lots of information , which he gave us. Yes, I should explain here what happened with that case. Practically everybody who learned of his cooperation reacted in the same way. There are potentially thousands of young men like him in Central America who could be used in the same way. There are some people, from the Miami terrorist mob, who offer up to two thousand dollars per bomb, plus airfare and living expenses. They take advantage of how easy it is for tourists to come here. The death penalty was in use for common crimes up to May of 2000. The Writer.- And it has not been used since then? The writer.- For three years? Fidel Castro.- Yes. It is a sort of moratorium. But I do want to clarify that it has not been abolished. There are two very serious cases of murder awaiting trial. One of them is a case where a group of four family members were murdered (two grandparents resident in Miami, a grandchild, the daughter of the former, and the driver of the car, residents of Villa Clara, who had gone to meet the grandparents at the airport and were on their way home along the highway). There are two very serious cases like that which create a very serious public opinion problem and are awaiting a solution. There is no commitment to a definitive moratorium. I think this is clear enough. In fact, the death penalty was not applied, but we have not relinquished it. I am explaining this because I don’t want to mislead anyone. We are now studying crime and the things that cause it. We are carrying out all kinds of studies. There are cases of such horrible crimes that they seem to be the work of mentally disturbed people. Anyone who has studied law knows that there is a principle in law that says that a mentally disturbed person is unfit to plead. Much research has been done in the world on the psychological reasons, which could well have a genetic or accidental origin, that cause people problems and make them violent. What are the genetic or accidental agents that affect the way the human mind works, which more or less turns these people into monsters? We are studying those factors. I think that we are moving towards a future in our country when we might be able to abolish the death penalty, not simply on philosophical grounds, but out of profound feelings of justice and humanism." In fact, nowhere have really deep studies been conducted of the human mind and the factors leading to crime. I believe that Cuba is the first country to conduct such a research, and we are working very quietly. By the 30 of this month, every handicapped person, particularly those suffering from any degree of mental retardation, will have been visited by graduates in Genetics. We are discovering many things, because until now nobody has made such studies, or cared to have them made. But we, the human rights violators, are doing it, because we have our people, and the human capital, and all the doctors we need, and the resources and the will to struggle to improve people’s health --and that from day one of the Revolution--, and the will to struggle for every human being. I have already mentioned the number of lives saved in this country just by reducing infant mortality, which is the lowest in this hemisphere and one of the lowest in the world, even lower than that of the United States of America, despite its enormous resources. And we are also saving many more lives every day with the 3-thousand doctors who are working for free in comprehensive healthcare programs in a number of other countries. An there is more: no program can be implemented today in Africa, no serious program to fight AIDS, without the participation of this country "that violates human rights". As you can see there is much hypocrisy in all that, that is why we should continue debating and arguing to once and for all do away with so much slander. I feel that when you think carefully about all that I have said, you will reach the conclusion that there will always be people who have to be isolated strictly because it is necessary, and not as punishment. Felipe González, who has attacked us so much recently, was the head of the Spanish government when dozens of ETA members were executed without trials. It was Aznar, the current head of the Spanish government and an ally of the superpower in the massacre of the Iraqi people, who in a meeting with the President of the United States on April 13, 1999, at a time when the war against Yugoslavia was getting bogged down, gave him this advice, and I quote: "If we are involved in a war, let’s be totally involved, to win, and not just a little bit involved. If we need to go on for a month, three months, let’s do it. I don’t understand why we still haven’t bombed Serbian radio and television stations." Hours later NATO ordered the beginning of Phase 2, and the bombings were stepped up, as were the number and diversity of the targets to be destroyed. On April 14 a convoy of Albanian refugees in Kosovo was the target of an air attack in which 85 people died, and that’s not counting those who were wounded. Two refineries and a residential neighborhood in Belgrade were destroyed in Serbia; 300 more planes were added to NATO’s forces. On April 16, the bomb attacks on television transmitters and bridges were increased. That same day, the most intense general attack in two weeks took place. Between the afternoon of Saturday, April 17 and the morning of Sunday, April 18, NATO planes carried out 500 sorties, bombing refineries, bridges, factories and dozens of other civilian targets, in what NATO itself called the most active 24 hours of the war. On April 18, oil refineries and chemical plants were attacked and destroyed in Belgrade and Novi Sad and the highway linking Belgrade with Podgorica, the Montenegrin capital, was rendered impassable. It is known that two days earlier the attackers had begun to use GBU-27 bombs, known as "seismic", which penetrate reinforced concrete and cause an intense tremor which makes the building crumble and affects many other nearby buildings. On April 19, civilian buildings in Belgrade and Novi Sad and the villages of Paracin, Kraligevo, and Sremska Mitrovica were attacked. NATO admits that this could have been mistakes. On April 21, NATO attacked the Yugoslavian president’s private residence, the Socialist Party building, three television stations and 20 shops in the Usche shopping center. On April 22, two NATO missiles destroyed the last bridge over the Danube in Novi Sad, cutting off highway and train traffic, and eight broadcasting stations. It was learned at the time that hospitals were only receiving emergency cases and dozens of children and young people aged between 2 and 19 in Belgrade were at death’s door because of a lack of the resources needed for dialysis. At 2:30 in the morning on April 23, Serbian television headquarters in the center of Belgrade was totally destroyed; 16 people died in the attack, another 19 were wounded, including many journalists, and another 20 were trapped in the rubble. NATO announced that it was focusing its attacks on communications, radio and television. In a 53-page report, Amnesty International, --and you know what this organization is about-- considered this attack on Serbian radio and television as a war crime since it was a direct bomb attack on a civilian target. Only ten days had passed since Mr. Aznar had given his advice in his meeting with the U.S. president. I ask Mr. Aznar to say if this is true or not. I have an important document here. It is rather long, with more than 15 pages. Applying the death penalty to the hijackers in Cuba was met with a far greater lack of understanding internationally than the arrest of the mercenaries on the U.S. government payroll, for obvious reasons I have already explained, plus the deluge of lies and disinformation unleashed by the media of the empire and its allies. Unfortunately, personalities whom our people hold in high esteem jumped in and gave their opinions and judgments without full knowledge of the facts and realities that should have been taken into account. We had also calculated and foreseen these risks. We do not expect them to share our points of view. There are also many honest revolutionaries in our country who are opposed to the death penalty, but who nevertheless understand the sacred duty to struggle to prevent millions of Cubans being executed by those who are trying to impose a global Nazi-fascist tyranny on all the nations in the world. When I speak of fascism, I am not referring to the internal political system of the United States. They can take away or limit many of the rights of the American people but nobody could install a fascist regime there. I am talking about a fascist world order imposed by the government of the United States, through its immense military power. I would not even use this word to describe the U.S. armed forces, which are educated in the tradition of strictly fulfilling the orders they are given, like the ancient Roman legions. If there was a holocaust of the Jewish people scarcely 60 years ago, today it is necessary to prevent a holocaust of dozens of peoples who are threatened with aggression and even extermination since, according to what is being announced, all weapons can be used to launch a pre-emptive attack on any dark corner of the planet. What is known as the Christian Western world should become aware of this fact before it is too late, as they appear to be doing with regard to the gigantic holocaust caused by poverty, hunger, underdevelopment, a lack of education and healthcare, neoliberal globalization and the current economic and social order imposed on humanity, which kills tens of millions of people every year in Third World countries. The Cuban nation is proud of its intellectuals, artists, scientists and all of its university educated professionals who have almost unanimously supported the declaration of the National Council of the Cuban Artists and Writers Union calling for the creation of a worldwide anti-fascist front. Our people are also especially proud of the outstanding group of internationally famous intellectuals and artists who issued the "Message from Havana to Faraway Friends." Countless intellectuals, artists, scientists and university-educated professionals have expressed their earnest desire to sign this now historic and exemplary Message. They want to place their commitment on record for present and future generations. Hundreds of thousands will put their signature to these words denouncing the fact that our small country is today under more threats than ever before from the superpower that is seeking to impose a fascist tyranny worldwide. Our supportive and deeply revolutionary people are equally proud of the five Heroes Imprisoned by the Empire who show the courage of a fighting and heroic nation which the masters of the world should not ignore, nor Hans Hertell, the U.S. ambassador to the Dominican Republic, nor the honorable brother of the President of the United States from Florida, who send us warnings that the barbarous war against Iraq carries a message for Cuba. It is, as a matter of fact, a message not only for Cuba but also a fascist message for the world. Neither should it be ignored by the so-called "dissidents", who today make their living from cooperating with the plans of the government of the superpower that wants to destroy Cuba, and wishes to impose a fascist tyranny on her as the "Message to Faraway Friends" reads. Cuba is fighting today the Giant with the Seven League Boots, whom Martí was the first to discover and whose footsteps not only extend over the lands of our America but over all regions of the world. Thanks to all those friends of Cuba who have defended her in this glorious moment! We shall continue to be upright and consistent, as we have been since 1959 until today. They will never have a reason to be ashamed of their noble support! Victory shall be with the peoples!